Hungarian rabbi and Talmudist; born in 1760 at Schwerin-on-the-Warthe (Posen); died Jan. 15, 1845; educated at the yeshibot of Presburg and Prague. In 1796 he settled in Hungary, at first living the life of a private scholar in Baja; but in 1812 he was appointed rabbi of Szabadka and in 1815 of Baja. His house became the intellectual center of the district. In 1827 he was elected chief rabbi of Hungary by the heads of all the communities, with the right to officiate as the highest judge, to summon the contending parties, and even to compel their appearance. He attended the meetings of the "asifah," or county communal gatherings, to supervise the apportioning of the toleration tax, to settle disputes, to record the minutes on important occasions, and to formulate decisions. No rabbi or ritual official could be appointed in the county without his consent, his decision in this regard being final. Religious questions and marital difficulties and law-suits, matters relating to elections and taxation, and differences between congregations and rabbis were brought before him, involving thousands of decisions during his term of office. Schwerin used his power with inflexible justice, even appealing to the authorities when necessary. He was not entirely untouched by the spirit of Reform. He gave to the sermon, for instance, its due place in the service; nor was he therein satisfied with the far-fetched interpretations of Biblical and Talmudic passages current at that time, but sought to edify and elevate his hearers. 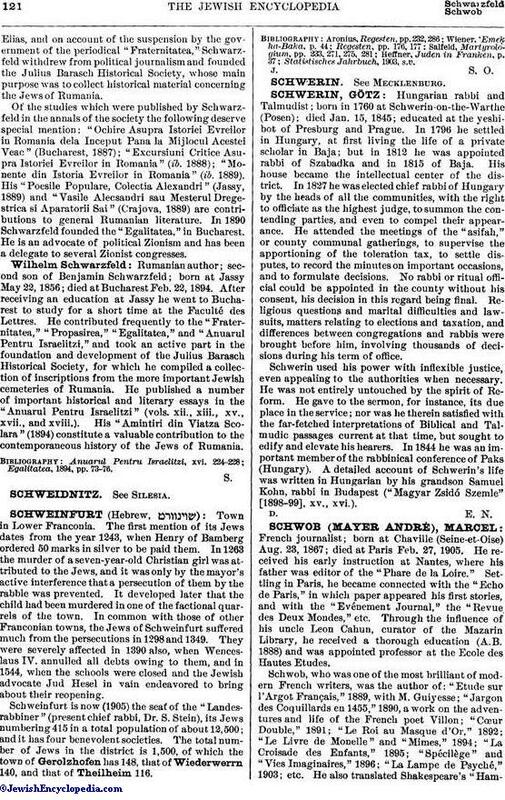 In 1844 he was an important member of the rabbinical conference of Paks (Hungary). A detailed account of Schwerin's life was written in Hungarian by his grandson Samuel Kohn, rabbi in Budapest ("Magyar Zsidó Szemle" [1898-99], xv., xvi. ).